The winter has been long, gray, and chilly. News of a sunny week-end at the beach was welcome as we turned our wheels toward the beach. The great Pacific did not disappoint! Waves and sunshine mixed with the fellowship of family and friends created a lovely meld of activities inside and outdoors. A pleasant surprise, miniature daffodils blooming beside the rental house, added an extra touch of cheer! There's no place quite like the Pacific coast! You should see it now - the Oregon Coast has snow. Snow-covered beaches are always a strange sight. So glad you enjoyed time with family and friends and a trip to the beach. 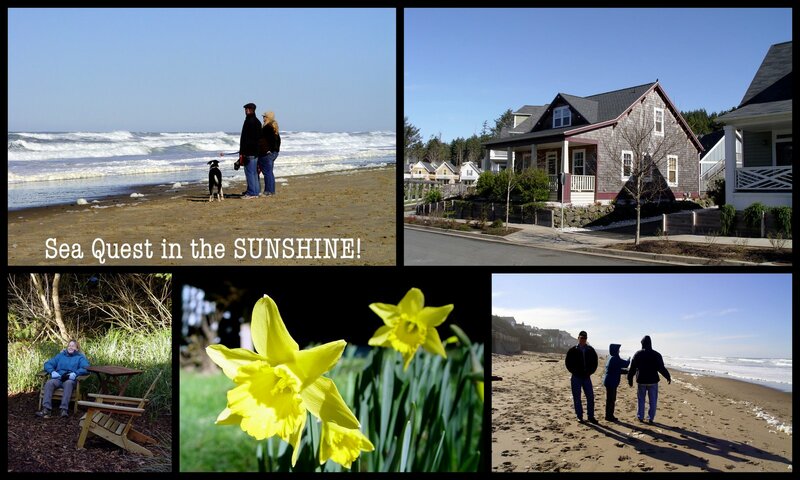 What a terrific getaway to be reminded of sunshine and the coming spring. It looks as if it was indeed a glorious day all around! Sunshine and daffodils, just perfect.